Basic Training Supplies include basic dog care supplies as well as dog toys. The main things you'll need are a collar, leash, and treats. Other than food, water, and health care supplies, these are the very basics of supplies for your dog. A nice collar that's adjustable and of good quality is recommended. Either leather or nylon collars are preferable. Never use a choke collar on your dog. An adjustable leash is the best to use for training. You'll be able to keep your dog close at first and gradually extend the length of the leash as your dog learns more control. Treats can work best when they're kept small. Small, chewy, dog treats are great for training because they don't fill your dog up and they're easy to keep in your hand or pocket while training. Additional props to use for training are basic toys such as balls, Frisbees, and squeaky toys that can be used to play fetch or do other tricks. 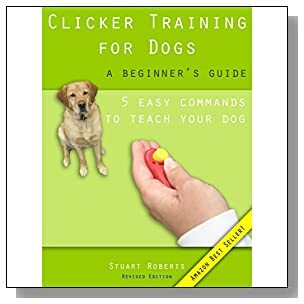 Clicker training supplies are similar to basic dog training supplies. You'll need a collar, leash, and treats just as in traditional dog training, and you can also use dog toys for fetch. The most important supply you'll need for clicker training is the dog clicker. There are several types of dog clickers to choose from and they come in a variety of price ranges. 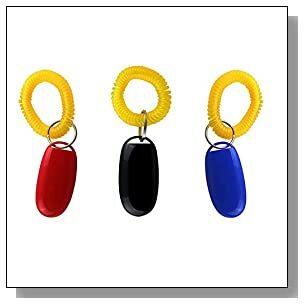 Read reviews of popular dog clickers to find one that works for you. For advanced dog training, you'll need to invest more into your supplies. Teaching a dog more advanced commands and tricks can be a fun way to bond with your dog. It can also be a way to get your dog involved in dog shows, talent shows, or show business. You can purchase ramps, hoops, and a variety of other supplies to help your dog become an entertainer. Specialized dog training should be done by someone who is knowledgeable and has experience. Specialized dog training includes hunting dogs, police dogs, and seeing eye dogs. Dogs can be trained to perform a variety of socialized tasks and take on important roles in our society. Some tools used may include harnesses, muzzles, decoys, special scents, protective gear, and many other training supplies. The job your dog will have dictates the supplies needed to train him. No matter what type of dog training you will be doing, the right dog training guide can be your best friend. You can get valuable information and tips regarding the specific type of training you'll be doing and step by step instructions on how to proceed. Becoming educated and informed can make a significant difference in your ability to train your dog effectively. With time and patience, any dog can be trained, so make sure you start early. Visit the main page here to learn more about dog obedience tips and then come see our tips here for how to train your dog not to bark and other bad habits. The principle behind clicker training is that the click noise given off by the clicker means correct. So the soon learns that the exact position its in or behavior its performing when the clicker goes off means that’s the correct position/behavior. When a dog is use to clicker training and is clear when its doing the correct behavior new behaviors are formed very quickly. The main things to consider when clicker training are rate of reinforcement, timing and motivation. Rate of reinforcement is all about how often your reward and how much of a reward you give. When first starting you should reward often and always remember quickly. You need to reward as soon as the dog has performed the correct behavior this way the message that’s right is crystal clear. As your dogs understanding increases the rate of reinforcement can be decreased and your dog should be holding the correct behavior longer. Timing is extremely important in any dog training you must use the clicker the millisecond your dog performs the correct behavior. Clicker training is all about timing the quicker you click and reward the faster the dog will learn the new behavior. The next major thing to consider is motivation without motivation you have nothing a dog must love to work. If a dog does not want to work then you have a serious problem its one hundred percent the training responsibility to make the dog love working. There are many ways to motivate a dog these include treats, toys, fuss and just play in general. Always keep your training short and fun ten to fifteen minutes at a time is perfect any more than this and the dog will get fed up. Remember that you should always finish training when your dog is keen and enjoying the training, never finish when your dog is bored and unmotivated as this produces nothing except a dog who does not enjoy working. 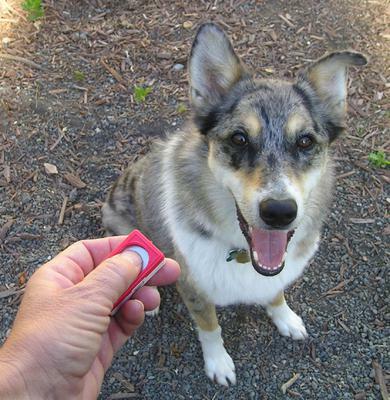 To get started clicker training all you need is a clicker, a reward and a willing dog. If you have these three things then you have everything you need to start clicker training. Experiment and have fun it’s the best way to learn about clicker training and training dogs in general. There’s no substitute to a good working relationship with your dog. When you have that great relationship you will find training so much easier because you already know exactly how your dog is going to react to everything you do. How did you like this dog obedience tips post? If you found this article helpful to you, you may want to share it with others by clicking the social networking buttons on the left side of this page – Thank You!